WBCE CMS – Way Better Content Editing. I have my WBCE 1.3.1 site set to English language. But some text used in General Settings is still displayed in German (I believe). A follow up question. Where is this counter "max" value set? my fault, you're right these words are hardcodet in German in the template file. Should be fixed in the next version. How do you want to do that? The template engine does not allow this change in a simple way. 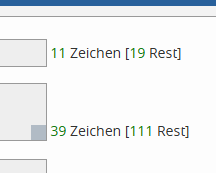 thought the easiest way would be to add the two words "Zeichen" and "Rest" to the language files and handle them like the other text in settings? Will have a closer look at that this evening.